I like Harley's New Year's Resolutions, Daisy! I think I will do them too. Harley is the perfect cat! You have some great New Year's Resolutions! We think the easier the better!!! They are very good resolutions! You are very smart, Harley. Making easy resolutions is the key to actually keeping them! poor Harley, he is a nice cat, keep trying to help him Daisy. 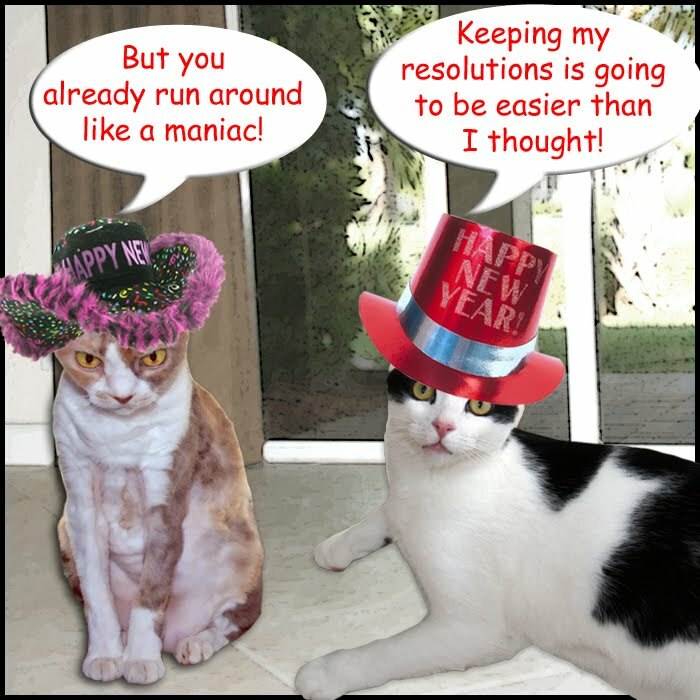 Yup those are terrific resolutions and we probably can stick to those. We love your New Year's hats. They are so stylish. Have a super week. too many human make New Year's "revolutions" -- crazy resolutions that are so radical they can't keep them. Keep em simple and you can accomplish anything! btw, I love your hats. So pretty and sparkly. 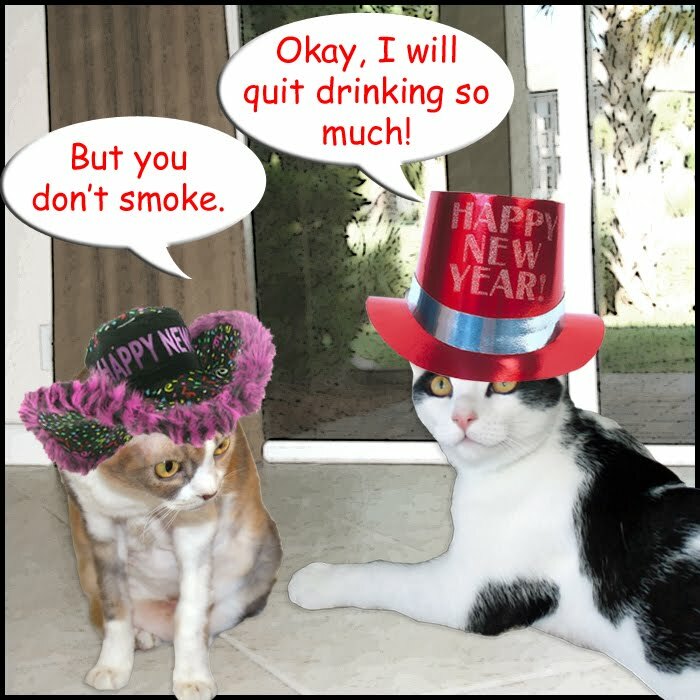 Keeping our resolutions is ever so easy for us cats! Hahahaha! 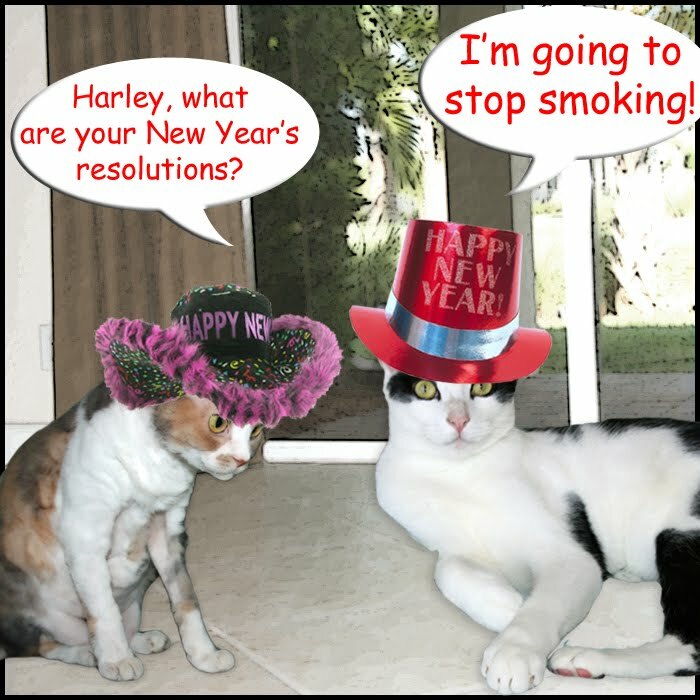 Oh Harley we wish everyones New Year Resolutions were so easy to keeps yours will be!! You've made it easy on yourself, Harley! We resolve to nap more. Haha! Harley, you are so funny!! Good philosophy. I'm going to reassess my resolutions. Very Funny! Hope you had a great Christmas! Thanks you guys...I really needed a laugh this morning. I can always count on you! Harley that means you are pawfect just the way you are! Harley, you are so funny! I think I'll resolve to run around like maniac too! I'm very glad you didn't resolve to stop wearing silly hats. Mum says thanks Harley for showing her where she goes wrong with her resolutions. Harley, mommy and I need to follow YOUR resolutions even though both of us just drink water and we don;t smoke either. That one about exercise fits both of us. I thunk I shall give up roast beef so I can eat more ham and fishy flakes! Boy was that easy! At least he made resolutions that he can keep! That's the way to do it, Mr. Harley! 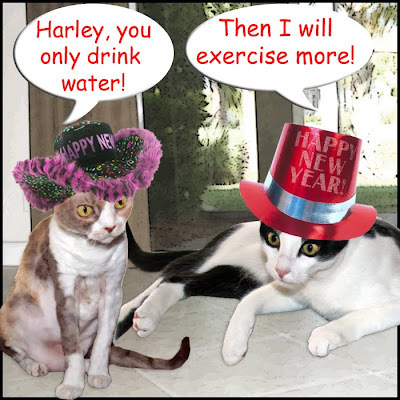 Harley, humans should have resolutions that they can keep like you do! You are one wise kitty! PeeEss: Daisy, your Christmas tree dress is the neatist costume yet!!!!!!!! I think we will do resolutions like that too! You are too smart Harley! Way to go Harley!!! Resolutions should be easy to keep! Harley we think that you did the resolutions the right way - pick things that are super easy to keep! I think Harley shood reezolve to git his own darnd blog! MOL! Our noo year resolution is to make sure we don't miss any of yoor posts! Haha I hope they have a good year! What a great system! We are gonna resolve ta play with rattly mice and eat treats!